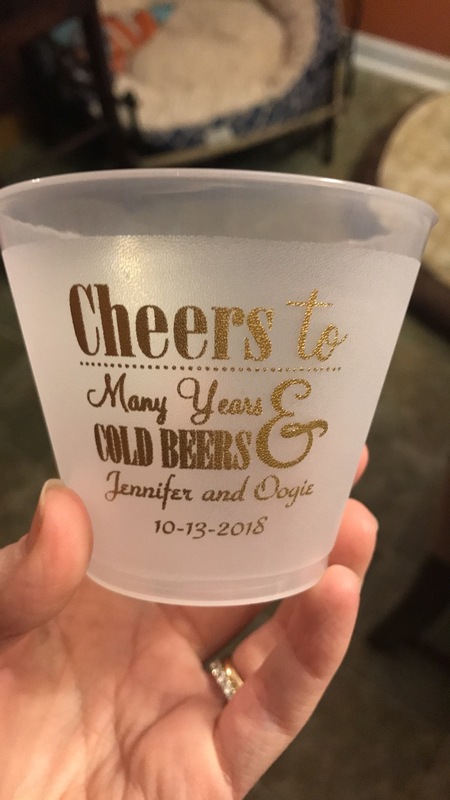 Shatterproof, dishwasher safe, 9 oz plastic cups custom printed with your choice of engagement design and up to three lines of custom text will add the perfect personal touch to your engagement party. Shatterproof cups are a safer alternative to glass, especially when using them for children, and make for quick and easy cleanup. Measuring approximately 2 7/8 inches high by 3 1/2 inches in diameter at the widest point, these cups hold up to 9 ounces of liquid when filled to the brim; comfortably holding 6 to 7 fluid ounces. Each cup is made of durable, BPA free, shatterproof frosted plastic that is reusable and dishwasher safe. Choose from assorted design options, imprint colors, and lettering styles to have a special message custom printed on your cups. Second sided cup printing is also available at no extra charge. Everyone loved the cups! They were perfect in size and the artwork was wonderful. Thank you so much! I loved the look of the cups, but would have gotten the bigger cup if I could have gotten my chosen saying on it. They could be a little more sturdy too. These turned out excellent. They are for my brothers engagement party. I can't wait for him to see them! These came out perfect and we cannot wait to use them for our engagement party. The sayings are too cute! The copper imprint is more rose gold in person which is what we wanted. Perfect for my daughters engagement party! Everyone loved the cups! Very good quality too! Thank you! Couldn't be more pleased with this item! Good quality. Also, they contacted me via phone and email to ask a question about the custom printing before processing! Very much appreciated!! I absolutely love these cups!! They look just as I pictured them to. E!!! Exactly as ordered- great price and speedy delivery! Cute, affordable cups with a quick turnaround. Absolutely loved the cups I ordered. They were a big hit everyone loved the personalized features on them. Perfect color, font, and style.